One of the most secretive and unusual rounds of Arab-Israeli diplomacy took place in the summer of 1998, when three private American citizens, businessman Ronald Lauder, his aide Allen Roth, and magazine publisher George Nader, made nine trips to each of Damascus and Jerusalem, trying to secure a Syrian-Israeli peace treaty. 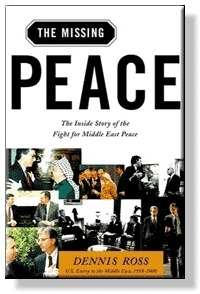 The publication of Dennis Ross's memoir, The Missing Peace: The Inside Story of the Fight for Middle East Peace (Farrar Straus Giroux) offers much new detail on the impact of this diplomacy in the months after Netanyahu lost the prime ministry in May 1999 to Ehud Barak. had received a piece of information that convinced them Asad would be willing to live with something less than an Israeli commitment to withdraw to the June 4, 1967 lines. Barak felt it would be possible to move quickly to agreement with Syria. Was Asad prepared to "validate" it? Only President Clinton would be able to find out, and so Barak believed it essential for Clinton to see Lauder and determine for himself if this was a promising track to pursue. If it was, it would have the added benefit of political cover, for it would enable Barak to say to the Israeli right that he was only agreeing to what had been accepted by Netanyahu. to ten points which they would have finalized except for Asad's insistence on reviewing maps on the border and the security arrangements and Bibi's refusal lest he lose all deniability. Then came Wye and the agreement with the Palestinians, Lauder explained, and Bibi did not have the political cover to pursue the effort further. Ross pulled out a map and asked for specifics. Lauder pointed out that "Asad was prepared to draw the border off the Sea of Galilee and off the Jordan River." Ross asked what "basically reached agreement" meant and Lauder replied that "what he would show the President was 99 percent agreed [on by the two parties]." Israel would withdraw from the "Syrian lands taken in 1967" to "a commonly agreed border based on the international line of 1923." Once I had looked this over, the President asked me what I thought. I told him it was "too good to be true." But now I understood why Barak and his colleagues believed they did not need to commit to the Rabin pocket and the June 4 lines. [The "pocket" refers to Yitzhak Rabin's having told Clinton that, were Israel's concerns satisfied, he would withdraw to the June 4, 1967, borders.] Now Sandy [Berger] and Madeleine [Albright] joined us, and the President told them I was skeptical about the content of the paper. But did I think Lauder was lying? I said, "No, he is sincere and I believe he believes much of what he is saying. But I am afraid he is not precise and what he considers minor differences are not so minor. Moreover, I think there is some real wishful thinking here." Where did I have the greatest doubts? I knew that the 1923 line was a complete nonstarter with Asad; in Asad's eyes, those were the colonial borders, and he would never accept them in a document. what questions he thought Asad might pose about the paper. He said Asad would have a problem with the bracketed language on the Israeli presence in the early-warning station—and that was all. What about the 1923 lines, not the June 4, 1967 lines? To my surprise, he insisted that Asad had agreed to this—and when Asad received the paper, we would see it was not a problem. Asad's response tended to reinforce my doubts. "This was really a bit strange," he said. He acknowledged having seen Lauder a number of times, but professed to know nothing about ten points. He said the effort with him had not succeeded and it had ended. So Clinton sent the paper Lauder had given him to Asad (faxed to the personal attention of the ambassador, who was instructed to hand deliver it without comment to Asad). Two days later, Asad responded, calling the President to say that Syria had not accepted this paper, and would not now. The effort with Lauder had ended; Asad preferred to work from the Rabin commitment—the "pocket"—and have us make suggestions to the two sides. Ross subsequently states that Asad considered it "a mistake" to have participated in the Lauder-Nader round of diplomacy. I pulled out the Lauder paper and showed it to him [Riad Daoudi, the Syrian representative to the talks] with the President's notations. I told him the President had gotten very enthusiastic when he was the ten points, and I reminded him about the value of having enthusiastic presidential involvement. The key for us was to take some of these points and build a structure around the traditional headings of withdrawal, peace, security, and the timetable. clearly impressed with the President's notes in the margin. But he said, "Dennis, I have seen these points; we spent thirteen hours going over them and drafting comments, and they don't reflect any of our comments. This is the first draft given to us, not the final version" in which he knew they [i.e., the Syrians] had insisted on the June 4 lines replacing the 1923 lines. was very important for us to know. Still, I added, there were legitimate points in the Lauder paper. We had a channel now, and we should build on it. Daoudi responded non-committally to this and negotiations ended for the day. then observed that even if the Lauder points were not accurate, Asad had accepted negotiating over them. Daoudi was admitting as much. But the next morning, Daoudi asked to speak to Ross alone. He said he has spoken to Syrian Foreign Minister [Farouk] Shara and the Lauder points were off the table. Syria required a formula that was explicit on June 4 and on the "aims and principles" nonpaper as well. This was the starting point for a formal resumption of negotiations; nothing less was acceptable. kept coming back to Barak's observation that the Lauder effort had produced a serious give-and-take on a paper. As I was being driven back to Zurich to catch a plane to Cairo, I came up with an idea. Why not recreate an indirect negotiation on a paper like the Lauder points. The Syrians and Israelis both accepted this formulation and talks proceeded on that basis. sent a letter to President Clinton enclosing an eight-point paper which he claimed included the final points that had been agreed upon by both sides in 1998. Gone was the reference to the 1923 borderline, replaced by withdrawal to a commonly agreed border based on the June 4, 1967 lines. Why hadn't we – Americans and Israelis alike – been shown this paper? Why had we seen only the first Israeli draft instead? My guess was that Bibi didn't want to give up deniability and so asked his friend [Ronald Lauder] to reveal only the ten-point version – not this later version reflecting Syrian comments. Whatever the motivation of the Lauder effort – or the reason for presenting the preliminary paper as a final version – it had certainly sown confusion. Now Lauder's "clarifying letter" to President Clinton indicated that Bibi Netanyahu had committed to withdrawal to the June 4 lines – which meant that Barak's position on peace with Syria was less forthcoming than Netanyahu's, at least insofar as it was revealed by Lauder's eight-point paper. I showed Foreign Minister Shara the eight-point paper in New York and he confirmed that this had been acceptable to Syria. But it was not acceptable to Barak. The points he had seen as so advantageous to Israel were gone. Negotiations did follow, but on a new basis, culminating in the Clinton meeting with Hafiz al-Asad in March 2000. That meeting came to naught, however (and Ross's account of how this came to pass is fascinating), and no significant talks have taken place since. Ultimately the Syrian-Israeli track had to fail during Hafiz al-Asad's lifetime because he was petrified of its implications for his rule. Interestingly, the Lauder-Nader round of diplomacy, for all its controversy and confusion, came as close to an agreement as has any other effort.